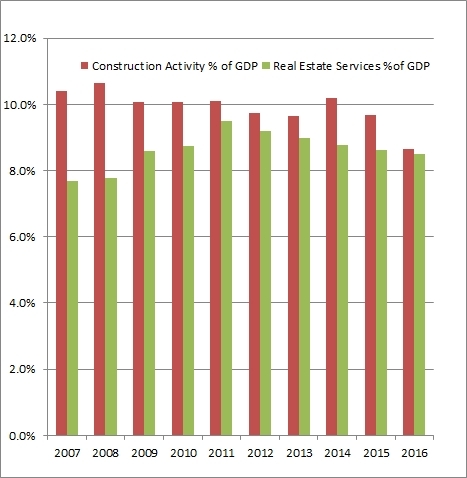 Construction activity accounts for approximately 8.7% of the Dominican Republic GDP (as of 2016). Real Estate services account for approximately 8.5% of the Dominican Republic GDP. (as of 2016). Construction activity and Real Estate services together represents almost 20% of the Dominican Republic economy it is therefore imperative to closely track trends and cycles of house and construction prices in order to asses the status of this important sector, this is extremely important when evaluating a real estate investment in the Dominican republic. On Dominican Hedge we provide information such as the "Construction Prices Index" and "Housing prices" in Dominican Pasos and USD keeping updates historical time series. these data will help perspective investors in the Dominican real estate market. The interactive charts below are updated when new data become available.